I suppose a congratulations is in order for co-writer-directors David and Nathan Zellner because they have created one of the most torturously unfunny comedies I have come across in a long time. It offers such a miserable experience that I noticed my body, spirit, and comportment wilting in unison about a third of the way through. I have no idea what possessed these filmmakers to go in the direction that they did; it goes to show that just because something can be done, doesn’t mean it should. 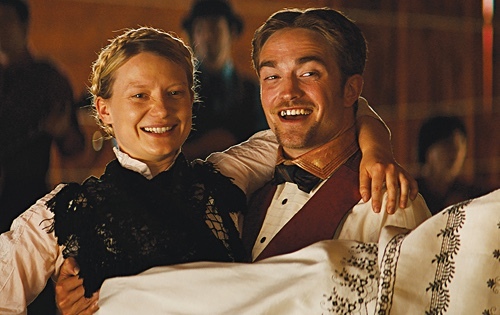 “Damsel” is a mishmash of comedies: a spoof of grand Western pictures that Hollywood used to make, a satire of the often romanticized American frontier, and a slapstick comedy that pokes fun of the roughness and lawlessness of the era. But none of them works, together or apart, because the screenplay has a certain attitude about it, a knowingness that fails to ground the material in such a way that viewers recognize the heart of the story despite hurricane happening all around. What results is an episodic boredom, a dirge so excruciatingly painful to sit through that one could feel IQ points dropping by the minute. It inspires the viewer not to look closer at the screen but to walk away. The plot is seemingly straightforward. The passionate Samuel Alabaster (Robert Pattinson) hires a preacher (David Zellner) to officiate a wedding ceremony, the latter unaware that the former’s love interest, Penelope (Mia Wasikowska), must first be rescued from hooligans. Nothing is at seems initially, but the sudden left turns are not at all surprising. These so-called surprises have little impact, if any, because, without them, the audience would simply have to endure uninteresting characters engage in increasingly tedious conversations. Notice that although many words are used, they are not meaningful because the self-awareness in the script undermines what characters are expressing, especially moments that are supposed to come across even mildly heartfelt. Pattinson has been great in other projects, particularly in the dystopian drama “The Rover.” Here, however, nearly every body language and distinct style of speaking comes across as a performance. Like the screenplay, the self-awareness is translated as fake at best and off-putting at worst. He has failed to create a character: what we see is merely a series of behavior that is supposed to be entertaining. And he has failed to create a convincing character because the screenplay is devoid of creativity or imagination. Wasikowska does not fare any better; it is like watching a mannequin take up space for fifty minutes. Some viewers may label this film as “weird” because it is a comedy but the end result is not funny. I, on the other hand, refuse to use this wonderful word to describe this most appalling work. The more appropriate word is “lazy.” The reason is because the Zellner bothers thought they could get away with creating a hodgepodge of sub-genres and the end product would be given a pass because it could be considered unique, something that had never been done before. But I ask: What’s the point of striving to create original material when the work is without sincerity, without soul? Comedies, you see, often have a point—even the darkest, bleakest comedies attempt to make a statement about, for example, the current state of our society or where it might be heading. Some comedies are more specific or more pointed in assaulting the viewers’ ethics or morality. And some simply try to entertain by casting a wide net—there’s nothing wrong with that. Being different is not enough; I am not interested in handing out participation trophies.